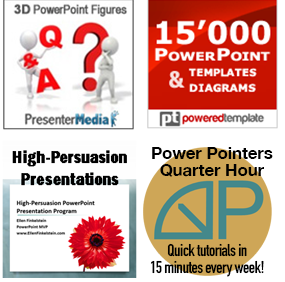 Yes, you can create your own graphics and icons for PowerPoint! Not all graphics can, or should, be photos, charts, or diagrams. Sometimes you want to represent a concept and need a more symbolic or iconic look. This 2-part series will explore 2 ways you can get result you need. Sometimes, simple shapes are enough. 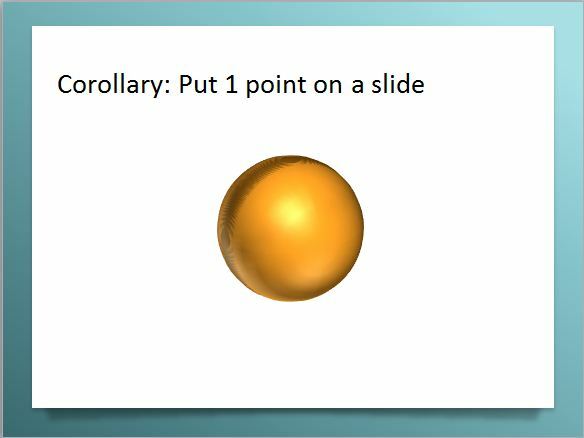 This slide’s graphic is just a circle with some 3D formatting. You can also use the Custom Shapes feature to make more complex graphics. You can find a link to all four tips on this topic here. I cover the first method here. Clip art — is it all bad? Most clip art is bad. It doesn’t have to be, but it is. Clip art like this, from Microsoft’s Clip Art gallery, gives clip art a bad name. 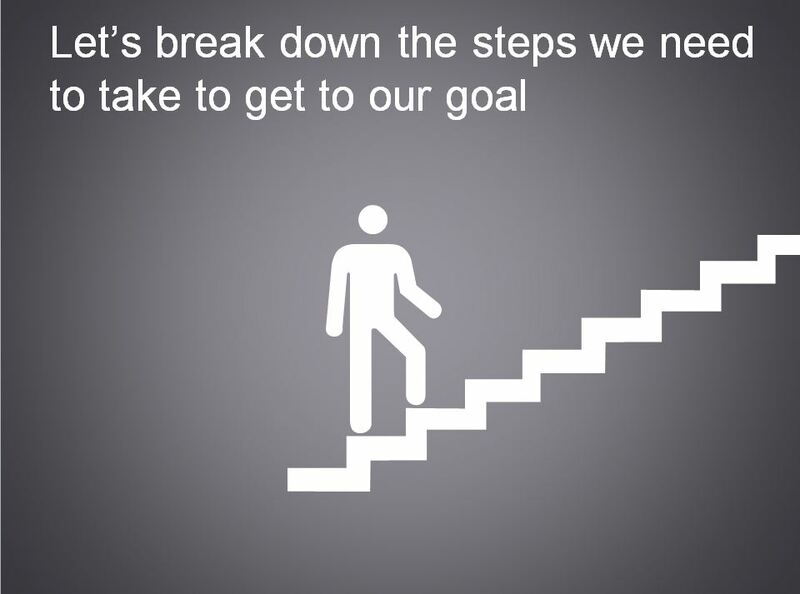 I just inserted several options that came up with a search on “steps,” but they are all corny, unclear, and unprofessional looking. If you look carefully, you can find simpler, more iconic clip art that you can use. 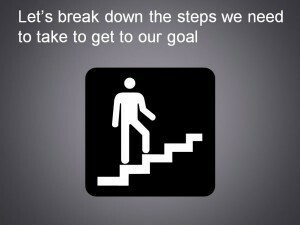 Here’s another option among the clip art “steps” search. This is much better! It’s simple, clear, and professional looking. But it can be improved. 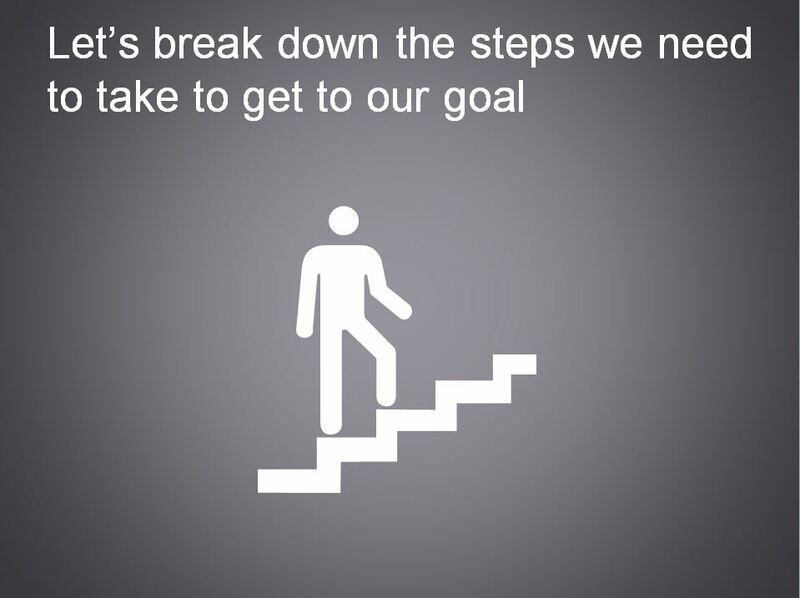 For example, you might want to represent the goal. You might also want to get rid of the black square, which seems to hem in the process of going up the stairs. The secret to modifying line art (also called vector art, because it’s made up of lines and curves) involves ungrouping it and converting it to PowerPoint objects. Select the image and press Ctrl + Shift + G. That’s the quick keyboard shortcut in PowerPoint 2007 and 2010. (Ctrl+G groups objects). In all versions, you can right-click and choose one of the Group/Grouping options. Funnily enough, you now need to ungroup the clip art a second time. When you do so, you see all of the objects. Another problem is that the person is going upstairs from right to left. Audiences who speak languages that read from left to right are used to scanning from left to right and will find the meaning on a slide easier to grasp if the image goes in the same direction. Right now, a person might think, “Is the person going upstairs or downstairs?” and will have to analyze the position of the man to figure it out. It’s always a good idea to make the meaning of graphics instantly understandable. It’s easy to reverse the image, using the Flip Horizontal tool. But you’ll get unexpected results if you do so on many separate objects, so you need to group the object again. This seems like unnecessary work. Why not flip the grouped art first and then ungroup it? It turns out that ungrouping unflips the image, so it turns back to its original direction! Select all of the images. In PowerPoint 2007 & 2010, press Ctrl + G. Then choose Format tab> Rotate> Flip Horizontal. In 2003, right-click and choose Group> Group. Then choose Drawing toolbar> Draw> Rotate or Flip> Flip Horizontal. Do you see how the slide now feels more forward moving? Now ungroup the image again; once is enough this time. What you do next is up to you. Here are the steps I took. Most clipart has a background square when you ungroup it. Usually, it’s white, but in this case, it’s black. You almost never need it. To delete the black rectangle, I selected it and pressed the Delete key. 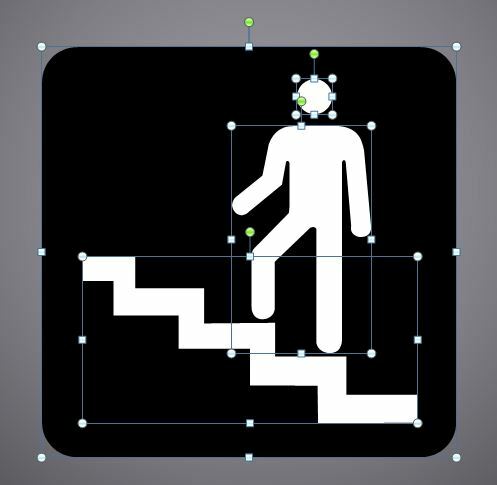 The only concern is whether the white man and stairs will have enough contrast against the gray background. I wanted the stairs to rise higher; they seemed too short to me. So I selected them (they are one object) and pressed Ctrl + D. Then I moved the duplicate up and to the right to extend the stairs, matching the spacing so the 2 stairs seemed like 1. The top didn’t reach the right side of the slide, so I selected everything and move a little to the right. 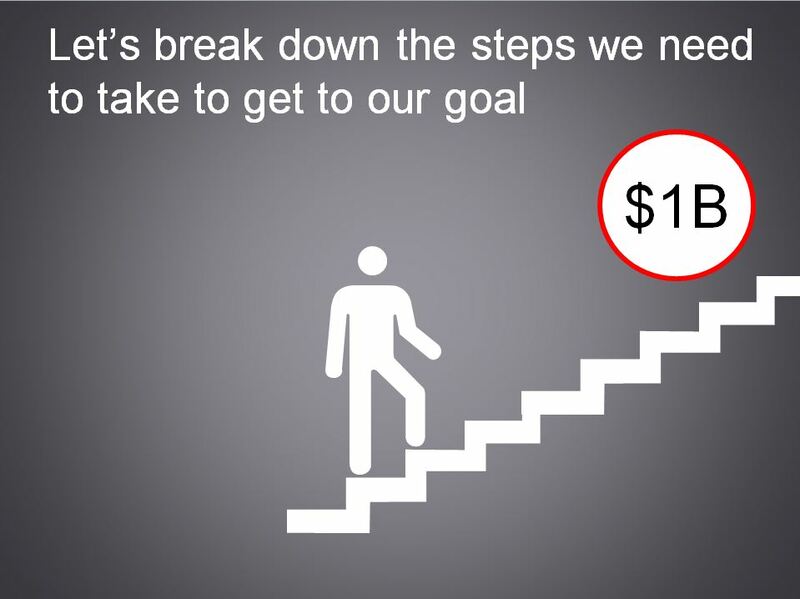 This gives the impression that the stairs continue off the slide — no limitations to our achievement! 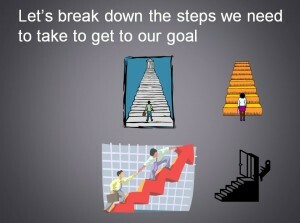 Presumably, your audience knows the goal by the time you get to this slide, but it might be good to repeat it. Then, the graphic will tell more of a complete story. You can add text to label any part of a graphic. In this case, I wanted the goal to stand out. The goal is to become a $1 billion company. I moved the entire graphic down to make room for the goal. It also felt more balanced. When creating a slide, it’s often a good idea to try our various placements until it feels right. Here’s the final slide. 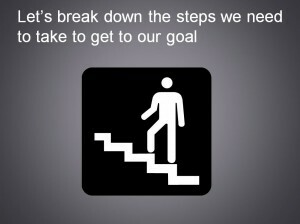 You could label the steps on this slide, or perhaps only on subsequent slides. Thank you. A very easy to understand tutorial (but is funnily really a word?). Glad you like the tutorial. Hmmm, I think funnily is a word. There seems to be some disagreement about it online. An adverb. If not, at least it’s a funny word!